What is a mineral specimen? I think the best-kept secret in the rockshop world is mineral specimens. The average person has probably never seen, and probably isn’t even aware of, the hundreds of beautiful, brightly colored, completely natural minerals for sale to collectors all over the world-sometimes for thousands or even hundreds of thousands of dollars! Scientifically a mineral is a naturally occurring solid, formed through geological processes, that has a specific chemical composition, a highly ordered atomic structure, and definite physical properties, which is often expressed in the typical outward growth of crystals. Minerals can have one chemical element, or be combined. Some examples are sulfides are combined with sulfur, oxides are combined with oxygen, and silicates are combined with silicon and oxygen. Up until 1995 only inorganic materials were considered as minerals. Since then the definition was changed to include orangic substances such as amber or jet. According to the International Mineralogical Association, the organization founded in 1958 who is responsible for tracking and naming new mineral specimens, there are currently more than 4,000 known minerals. Only about 150 can be considered common or at least available, and the rest are rare. Minerals in the industry are used for energy, buildings, paint, and even in manufacturing. Minerals are cut into gemstones: diamonds, rubies, etc. There are minerals from which we get metals: including gold, silver, copper, lead, steel, and iron. Because every mineral has its own unique chemical composition and atomi c structure, there are lots of scientific ways to identify minerals. Of course, to the naked eye it can sometimes be difficult to tell some minerals apart. Most minerals owe their color to the presence of impurities-copper ore tends to be blue, iron is red, and nickel is green. Some minerals can appear in a rainbow of colors. Fluorite is a good example. It can be found in pinks, yellows, purples, greens, and blues, as well as clear! Luster is very useful in identifying minerals. The luster is the appearance of the surface. It is metallic, shiny, dull, silky (meaning fibrous), or pearly (meaning iridescent). The most common luster is known as “vitreous” which is like glass. Minerals can be opaque (can’t see through them), translucent (light will pass through them) or transparent. The Moh’s hardness scale measures the hardness of minerals on a scale of 1-Talc being the softest, up to 10-Diamond being the hardest. The scale simply means each group can scratch the next softest group and any of the others below it. Cleavage refers to how a mineral specimen breaks when struck. If it breaks into smooth flat surfaces, that is referred to as cleavage. Fluorite again, is a good example of this. 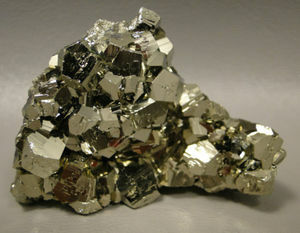 Metallic minerals, especially those containing cobalt, iron, or nickel, will often attract a magnet. The majority of minerals develop into crystals. Crystals actually come in many different shapes and sizes. There are basically seven different types of crystal formations. However nature is not perfect and there are many variations of these standard shapes. Crystals can be microscopic to humongous. Gypsum crystals have been found in Nica, Mexico that are 40-60 feet long and 15 feet across! Some minerals are cryptocrystalline. They are made up of microscopic crystals tightly laced together and actually appear massive. Minerals that are not crystals or cryptocrystalline are called amorphous. Minerals usually exhibit what is referred to as “habits”. This means they tend to grow the same in shape or appearance, regardless of where they are from. Some habits are dendritic (tree-like), drusy (a coating of tiny, tightly packed crystals), and stalactitic or stalagmitic. A lot of mineral specimen collectors specialize in certain characteristics, or elements. One group collects only fluorescent minerals. Fluorescence is when a ultra-violet light is held over the mineral, it actually glows in neon colors. As a rule, fluorescence is not a strong identifier of the type of mineral. It is actually more reliable in determining an origin as many deposits have very distinct fluorescence. Fluorescence is caused by the incorporation of small metal impurities in the mineral. Because each mineral may contain a variety of these metals, not all minerals that are the same, will fluoresce the same. The same mineral from different locations may fluoresce a different color, or not all. 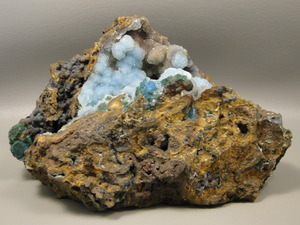 These impurities often affect the color of the mineral. Copper can make a mineral green or blue, manganese can make them purple or pink, etc. Some of the trace minerals that fluoresce are chromium, manganese, cobalt, nickel, tungsten, etc. If iron is present in any amount-it will prevent fluorescence! Minerals that fluoresce can often be plain in color and uneventful when the light is off. Even now minerals are still forming in the earth. They usually form from a vapor, a solution, or a molten mass (volcanic activity). When pressure or temperature changes occur, the mineral can actually be altered. This is called metamorphism. Minerals can form very quickly, within a few years, but the average mineral is formed over thousands or hundreds of thousands of years. For more detailed information check out Mindat.org, it is the largest mineral database and mineralogical reference website on the Internet. This site contains worldwide data on minerals, mineral collecting, mineral localities and other mineralogical information. See what mineral specimens we have for sale in our online rockshop.